Bookvip - Don't Do It!! First and foremost, we honor all bonuses offered and paid for. Please note that the resort provided you with your $200 resort credit when you completed the resort’s presentation. In order to enjoy the other bonuses you received, all you need to do is call customer service and an agent will be happy to assist you. 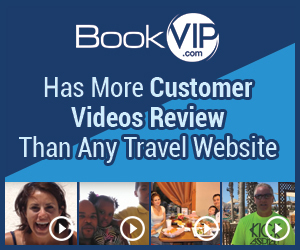 Although it is disappointing that your expectations were not met upon arrival at the resort, and your complaint is definitely valid, it belongs more on Trip Advisor about the resort than directed against BookVIP. Your comments are also a bit surprising since the resort you chose is #12 on Trip Advisor’s top 25 all-inclusive resorts around the world. In addition to which, the resort received no complaints from you and only has 1 incident registered when your husband arrived at one one of the restaurants improperly dressed according to the dress code of the restaurant. The resort’s records reflect that Mr. Pankratz walked out and did not return. Our special promotional packages are sponsored by the resorts and the rooms are discounted up to 77% because the resort is paying for your room in exchange for your time during the resort preview. You saved $2,000 on your vacation package, not to mention the bonus gifts you received. As the booking company, BookVIP’s job is to ensure that all guests are eligible for the promotional packages before reservations are made and sent to the participating resort provider. BookVIP has no control once you are at the resort. The reason why we have over 3.9 Million Facebook Likes, more customer video reviews, and have sent over 100,000 people on vacation this year alone is because we are the worldwide leader in promotional packages - that's our specialty. If you meet the resort's requirements and agree to attend the resort preview, you will receive the promotional rate. First of all, they will lure you into purchasing your package with "bonuses" they have no intention of honoring (I was promised $500 off of a future package and $100 Amazon gift card for purchasing my package the day I was going to just put a deposit on it and $200 worth of resort credits and 2 free nights in Miami with a Yacht tour after I submitted my credentials that proved I met their criteria for their conditions...which basically is that I am married to the person who will be accompanying me and that we make enough money to afford their ridiculously overpriced discounts packages). Then they fail to let you know before taking your money that there will be conditions to you receiving your package at the discounted rate. Once you get to your resort, you will be put in a substandard room (no ice machines, refrigerator temp was luke warm, and air conditioner maintained a nice (un)comfortable 78 degrees. My husband complained until they did put us in another room where the the refrigerator at least worked and the staff got us a fan which made the room temp tolerable. The staff really was the only saving grace to our whole vacation. They were friendly and tried to make our stay as comfortable as possible. We were offered to be upgraded to a nicer room at the neighboring resort (where we were subjected to over 3 hours of sales pitches-no...it isn't 90 minutes like they originally predict, or even 120 like they advised us of later on. Three. Full. Hours. Had to convince 3 different people that no really means no. And we drove an hour there and an hour back to our resort so basically we wasted a half of one of our 4 days there. Oh, and the condition of the upgrade...we had to purchase one of their extremely overpriced packages. Which, by the way, is discounts on future vacations...cuz this one is working out so well for us! My husband was drinking his beer over ice...yep, over ice. Didn't get a cold beer the entire time we were there! We would have just put some in ice...but again, no ice machines! For me personally, the worst part of the whole experience was the fact that the pool water felt like bath water. Bottom line...pay a little more and get a real vacation! I liked: Staff at the resort were very friendly. I didn't like: False advertisement. Review #1359158 is a subjective opinion of WordyIndri417.